Have you accidentally cracked your iPod Nano 6 screen? If you can no longer see the display on the screen you will need this part replaced. 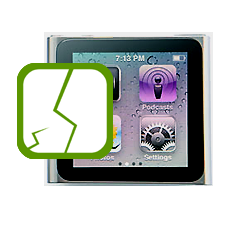 Sadly Apple does not offer warranty repairs for iPods with broken screens, we can however offer a simple cost effective and fast screen repair for your iPod Nano 6th gen.Allow our professional technicians to install the part for you, as many people accidentally cause more damage to the iPod when attempting screen repairs, resulting in a more costly fix. *Our normal repair turnaround times are 3 - 10 working days. We always aim to complete repairs as fast as possible. This is an in-house Apple iPod Nano 6th Generation repair service, when ordering this service you are required to ship your iPod into our repair centre for works to be undertaken.